Previous socially negative experience such as exclusion. In order for integration and learning and living together to succeed for all concerned, we base decisions on admission on the existing class and group situation and on the individual prerequisites relating to the pupils involved. The manageable size of our school and of the boarding community enables an overall form of support and accompaniment that is closely related to the needs of the child. Our offers comprise a large number of affirmative support measures. We are a small school and boarding community with classes averaging 15 pupils and boarding school groups of eight to twelve children and young people. This makes it possible for us to establish trusting relationships. A clear structure of the day, the week and the year provides orientation. We coach children and young people when it comes to workplace layout and drawing up learning schedules and we accompany them on a daily basis. Through individual support and a personal timetable to suit their immediate needs, re-integration after a long period of absence from school, as a result, for example, of illness, can be successfully achieved. Gaps in knowledge can be closed with the help of supervised learning periods and additional teaching. We support children with dyslexia and with reading and spelling issues in our special reading and spelling class. 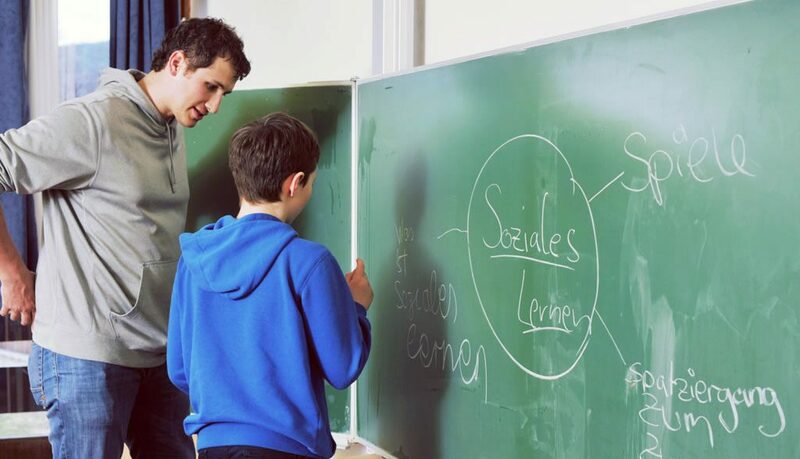 Social learning on the part of our pupils is realised on a daily basis, in particular, for example, in the class lesson, in internships, in projects, in group activities in the school community and within the framework of social services in the grounds, in service obligations, in the pupils’ café, etc. Owing to the small size of our community, conflicts do not escape our notice. We develop conflict-solving strategies together with the children and young people themselves and can thus take effective steps to prevent mobbing. The use of media is limited and we keep tabs on this. There are single rooms for children with special needs such as, for example, children with autism or ADHD. We take into consideration special diet requirements. Our kitchen staff are schooled in dietary matters and are aware of culturally-based differences. With the parents of the boarding school children we have arranged at least four firm dates a year for meeting and talking with each other, and, where day pupils are concerned, there are two fixed dates (the learning progress talks) for exchanging information. We regularly discuss school and social support measures in our conferences and in the course of exchanges with external experts. We guarantee social-pedagogical backing and school social work through a multi-professional team. Where necessary we will cooperate and exchange information with therapists and doctors in the framework of outpatient treatment. An article in the Süddeutsche Zeitung of 27 May 2016 that is well worth reading describes the work of the max-Rill-Gymnasium and the way the school deals with autistic pupils. The parents of two children with autism are at present fighting to make it possible for them to be able to attend our private school, because they consider the conditions there more suitable.